Pair any hat here with an imaginative gown and you'll get retro with an edge. Though wearing a well designed hat has always been classic, we're seeing them more and more in upcoming, collections. My theory on le chapeau? Lately there's been an evolution from those fascinators and pouf veils we still love so much into full blown versions of hats. Designers are coming up with fresh innovations all the time; hats can be hybrids--a combo of headpiece and veil-- as is the 1950s-style circle of feathers by Batcakes in the above post photo, or as wide and floppy brimmed as the farthest photo below. The point is, since we're loving hats so much lately, designers are getting the message bringing out more of these beauties each season. Top Hat or Derby anyone? Why not? If a man in a tux can wear one so can a bride in a gown. You can use some of the same guidelines choosing hats that apply to veils: the more minimalist the gown is in detail, the more ornate the hat can be; whereas the more ornate the gown, the simpler the hat. Once you start trying them on, you’ll see it’s all just a matter of getting the symmetry right. You do need to get in front of a mirror, gown on and alterations done to rightly evaluate how the hat and gown work together. Experiment. Getting the right look is all about personal choice and working out the proportions you like. And speaking of proportion, if you’re petite you can certainly take the width of a picture hat as long as you scale down the brim some to match your proportion. Also any hat that adds height like a derby or pillbox will work well. A taller bride with her heart set on one of these styles might have to experiment a bit—wearing a pillbox tilted to the side or back further on the head. She might have to forego the derby altogether and settle on something lower in the crown. Generally, fuller silhouettes like ball gowns need wider brims to balance out the skirts, although evening gowns and sheaths also look great with wide brims. 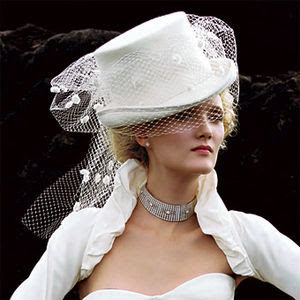 Smaller hats work best with more columnar looks; try adding poufs of veil or netting to work with fuller skirts. Below are some excellent online resources for hats to get you started in your browsing. Best of luck . . .